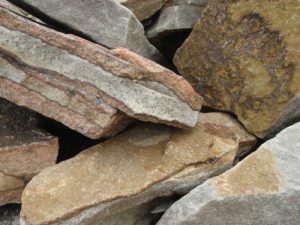 Flat pieces of stone available in a variety of colors, small pieces (6” x 1 ‘ @ about 1” thick) range from 4 to 40 lbs, larger pieces (3’ x 3’ @ about 1.5 -2” thick) can weigh up to 200 lb ea. Used in a large variety of applications such as: patio’s, natural walk ways, as a natural veneer on homes, pillars, buildings, landscaping edging, waterfall features, and around ponds. 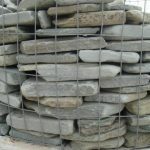 This stone can also be used in fish, snake, lizard and turtle tanks.